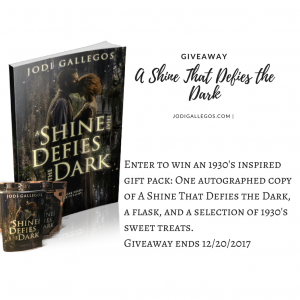 A Shine That Defies the Dark releases in one week (12/5/17)! How can it be coming up that soon? In celebration of the upcoming release I’m hosting a giveaway. Enter now for a chance to win a signed copy, a flask, and a selection of 1930’s sweets. Follow the link for the Rafflecopter entry. A winner will be announced on 12/20/17. Entered and have everything crossed as I much prefer reviewing a hard copy than a kindle copy! Much easier to post it note! Honoured to have shared this in my Must Read Releases post at http://turadh.blogspot.co.uk/2017/12/must-read-releases-5th-december-2017.html and thank you for stopping by!